YesButNoButYes: Flying Cars Coming Soon! 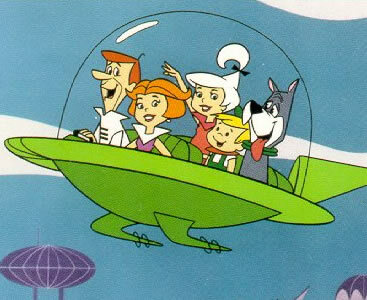 I've waited my whole life for things to look like the Jetsons and Back to the Future II. Where are my meals in pill form? Why can't I hydrate a pizza? How about a personal jet pack? Come on, science, get with the program already. We may be closer to futuristic, gravity-defying utopia. A Boston-area company recently ran a successful test of a car/plane hybrid. I imagine they will be available at Sharper Image and Brookstone by Christmas. said sarcastic one on March 19, 2009 3:56 PM. I mean we'll have Sharper Image back in the future. Yeah, that's what I meant. said Johnny Wright on March 19, 2009 4:11 PM. What a relief...let me fish those gift cards out of the trash!!! said sarcastic one on March 19, 2009 4:17 PM. Actually cars like these have been around for decades. A vehicle that with a pull of a lever the drive train goes from wheels to propeller; wings either installed manually or extended from the sides like a tip-out on an rv. Refer to James Bond flick "Man with the Golden Gun". said G on March 22, 2009 1:22 AM.